By far, this is the most spectacular and insane photography of an aurora borealis I’ve ever seen. When I showed this in our virtual bullpen, the unanimous reaction was complete awe. Auroras emit light because of the emission of photons by oxygen and nitrogen atoms in the upper atmosphere. Those atoms get excited—or ionized—by the collision with solar wind particles, which are accelerated by the Earth’s magnetic field. As the atoms get excited or return to their normal state, they emit visible energy. When it is an oxygen atom, the light emitted is either green or brownish-red, depending on the energy level absorbed by the molecule. Blue happens when nitrogen gets ionized, and red when it returns to ground state. 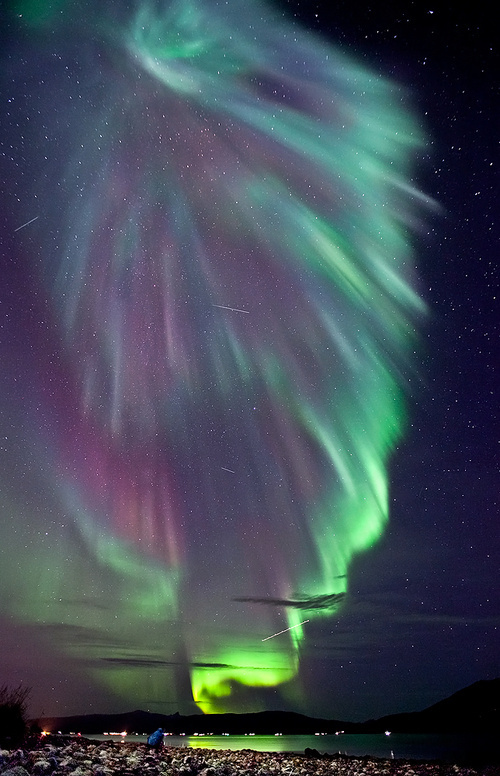 It was photographed by Ole Christian Salomonsen over Tromsø, Norway, using long exposure. That’s why you can see streaks from satellites and an airplane crossing the firmament.